Glasgow City and Hibernian Ladies will contest the Scottish Women's Premier League cup final. 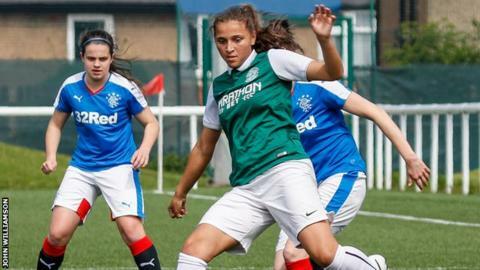 Hibs defeated Rangers Ladies 4-1 in the earlier kick-off at Ainslie Park through a Abigail Harrison double and further goals from Lizzie Arnot and Sarah Ewens. Holders City then saw off Aberdeen Ladies through a single strike from Clare Shine on the stroke of half-time. The two will meet at Ainslie Park on 15 June, a re-run of last year's final. Hibs were runners up to Glasgow City in all three competitions last season, but the League Cup was the closest they came to silverware, taking the champions to extra-time before eventually losing out 2-1. They lost 2-0 to Scott Booth's side last week, though head coach Chris Roberts praised the way they bounced back against Rangers. "Today was a fantastic response to last week," he said. The girls were an absolute credit to themselves and the club." Glasgow City head coach Booth said: "It's a great feeling to have another cup final to look forward to. "Aberdeen made it really tough for us but we know we can play much better. Hopefully we can show that in the final."